Strudel pastry filled with cream cheese and yoghurt, enriched with banana slices. Roll out the dough with his brisée baking paper on a work plan. Switch the mixeryogurt with cottage cheese, egg yolk and sugar. Whip the egg whites into the mixture and incorporate. Spread the cream on the pastry, leaving a border all around of a free and distribuitevi cm above the banana slices. Sprinkle almondflakes, roll the pastry and seal well. Put the strudel into a baking dish lined with paper which was wrapped in puff pastry and bake in a preheated oven at 400F for about 35-40 minutes. Meanwhile, melt the chocolate in a double boilerand Incorporat milk. 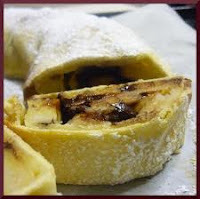 Serve the strudel warm or cold, accompanied by hot chocolate sauce and dusted with powdered sugar.